Photofacials—a skin treatment that uses a light-based technology to boost collagen and lighten the appearance of blemishes—requires high-tech equipment and is offered at medical spas, specialized resorts, and holistic care centers. There are many different types of photofacial procedures available, making it important to understand the difference between the various rejuvenation technologies. And while there's relatively little recovery time associated with these types of procedures, you may want to avoid one altogether while on vacation because side effects may arise and UV exposure can agitate already sensitive skin. The two most popular photofacial treatments are IPL (intense-pulsed light) and LED (light-emitting diode). LED treatments (often referred to as a non-IPL or "light therapy") work best for minor skin problems since they act only on the outer layer of the skin's epidermis. This treatment is often conducted via a handheld device or lamp and offered more readily in a day spa. For more serious conditions that affect deeper layers of skin (like age spots and wrinkles), IPL procedures work better. Whichever you choose, speak with an esthetician first about developing a skincare routine that will prolong the effects of the treatment and prevent further damage. LED treatments work best if you have sensitive skin or just want to treat a minor blemish, wrinkle, or mark. An LED photofacial is painless, cool, and relaxing and uses a narrow spectrum of light to gently boost collagen, creating plumper, younger-looking skin. This procedure can also kill the bacteria that causes acne and is sometimes offered as an add-on feature to a regular facial. While some people notice immediate results, most will benefit from a series of LED treatments—estheticians recommend six for best results. Once completed, you should maintain a strict skincare regimen and engage in regular monthly treatments to restore facial tissue and tighten aging skin. IPL treatments are more robust than LED photofacials and are usually offered at a medical spa or at a results-driven day spa. 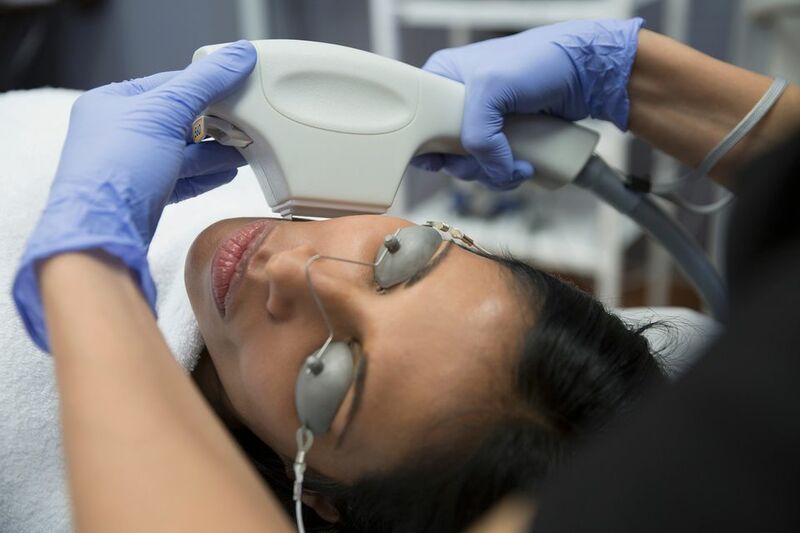 IPL photofacials treat a variety of skin conditions like brown spots, broken capillaries, and spider veins, but the majority of people who invest in this procedure are looking to erase wrinkles. During the procedure, the technician emits a blast of light at intense pulses that absorb deeper into the skin than that of a LED treatment. And while some IPLs have cooling devices, the heat from the light can be uncomfortable and even painful. IPL treatments also require several visits and take a while to heal from (two weeks is recommended between each visit). The number of IPL photofacials you need varies depending on the condition and the desired results. Both LED and IPL facial rejuvenation treatments have many benefits. But, you may want to avoid booking one during vacation due to the associated inconveniences and risks. After your appointment, you'll need to avoid makeup, abrasive scrubs, or scented soaps for a full day, depending on your skin's agitation and sensitivity. You also should avoid the sun for 24 hours or more, and then apply a high-rated SPF sunblock to your face if you plan to be outside. Additionally, LED and IPL treatments can be painful, both during the process and for a day or two after, so you'll need to evaluate the beauty benefits versus the lapse in relaxation time. Plus, photofacial treatments may leave you with reddened skin, which can later peel off in brown patches and look less-than-attractive in photos. An LED photofacial has a relatively low risk of side effects aside from reddened skin and increased sensitivity. But IPL treatments can leave you with a host of issues to contend with. Swelling, redness, the temporary darkening of age spots, crusting, bruising, and blistering are among some of the side effects of this procedure. People with sensitive skin should be especially wary of booking this treatment while on vacation due to these potential issues. Plus, if you run into a problem like an infection or an allergic reaction, it may be difficult to follow up with the spa you visited while traveling.